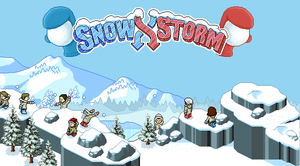 Snow Storm (also known as SS) was a game on Habbo (based on an old computer game called Lumisota) in which players must try and throw snowballs at others to earn points for their team. In late 2006 SnowStorm was released, however due to coding problems SnowStorm was removed until after the switch from the Shockwave client to the Flash client. There was a public outcry for several months - the players wanted Snowstorm back. On Monday the 12th of December 2011, Habbo responded to this when they re-released SnowStorm onto the hotel, under the reformed name SnowStorm Shuffle - however not everyone was impressed when they found out that only VIP members could play. Habbo later changed this so that non-VIP members could play up to 3 times per day whereas VIP members could play as many times a day as they wish. SnowStorm was removed entirely in 2014 along with all games featured in the Game Centre. There have been no signs of SnowStorm making a return to Habbo Hotel, which has been met with negativity towards Sulake on the descision, much like the removal of Battle Ball and the implementation of Battle Banzai as this becomes harder to find others to play with in private rooms. The aim of the game is to win points by throwing snowballs at the opposing team. When a player clicks the Games tab on the sidebar located on the left of the Habbo client), the Games dialog will pop up and players will have a choice of either viewing instructions on how to play, viewing the SnowStorm leaderboard or start playing. The 'Play now!' button starts the game, and the player will join a team of nine others (which will make up a team of ten people) to play SnowStorm. To make this process fairer, the system automatically allocates who is on what team (either red or blue). Once everyone is ready the team will enter the playing arena. On the screen a user can see their Habbo's head, energy, points they've personally scored, how many snowballs they currently have, time remaining and overall points for the red and blue teams. There is also the option to quit and to Call for Help. Players move around by clicking squares - the normal way players move around on Habbo - and clicking on a Habbo throws a snowball at them. Each player can only take five hits, any more than five and they'll fall to the ground, frozen from play for five seconds. To throw snowballs over large objects (such as trees), players can click the Shift button whilst clicking on the opponent. Once the player has run out of snowballs, they need to click the 'Scooper' button, which makes their avatar go down to the floor to scoop up some snow to create a snowball. This page was last edited on 15 May 2018, at 15:03.